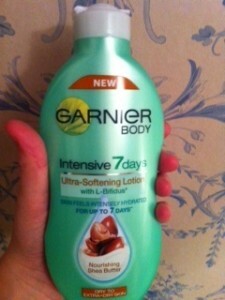 The product – Garnier Intensive 7 Days Daily Body Lotion with nourishing shea butter for dry to extra dry skin. The range – Also comes in aloe vera for normal skin, mango oil for dry skin, honey for sensitive skin and cocoa butter for dry and rough skin. Garnier say that this product will leave the skin feeling intensely hydrated for up to 7 days, which is based on trials of 241 women who used the cream regularly for 4 weeks and then skipped a week. After this 9 out of 10 women apparently went on to recommend the cream. The cream also claims to be enriched with natural-based Shea Butter and L-Bifidus, inspired by probiotics, which have been selected to meet the specific needs of dry to extra-dry skin as well as boasting super fast absorbancy so you can get dressed in a flash. The results – My first impression of this cream was that it was extremely thin and lightweight. As promised it smelt delicious and really did absorb instantly into my skin. This is of course a positive but as someone with extremely dry skin I had to resist the urge to keep putting more on to make sure it was working! Since then I have learnt that a little goes a long way, and just because it isn’t thick and doesn’t sit on the skin it doesn’t mean it isn’t doing its job properly. I’ve been using this moisturiser for almost 4 weeks now and although there has been the odd one or two days when I’ve jumped out the shower and haven’t moisturised (which was fine!) I couldn’t go longer than two moisture free days without feeling like my skin was really thirsty. All in all a good product which I would buy again but it doesn’t perform the once per week moisturiser miracle I was hoping for.